If you’ve read prior posts, you’ll know that something big is happening to me this year. And, I want to share it with you. I’ve written a storybook for kids to help them with the same issues I’ve been writing to you about since 2009. I posted my big cover reveal a few weeks ago. Now, you can be a part of the story itself. I write this sentence with shaky hands and a lump in my throat. I’ve never been prouder (or more frightened) of anything I have done in my professional career. Seraphina Does Everything! is available for pre-order on Amazon. Right now. Oh, my goodness. Seraphina wants to do it all. And she does! From soccer to ballet to French club, her schedule is jam-packed. There are so many options and doors to walk through in life, and Seraphina doesn’t want to miss a thing. that might not come again. through winter, fall, and spring. So, if Seraphina is doing all the things she wants to do, then why does she feel so blue? With some help from her dad, Seraphina discovers that in trying to do everything, she is missing out on some of her favorite things, like playing hide-and-seek with friends or playing catch with her dog. In today’s world, kids are often as over committed as adults. They feel pressured to participate in every activity from sports to dance to social clubs. And none of these things are bad until they begin to steal our children’s joy. Seraphina Does Everything! helps children understand that life isn’t all about doing. It’s also about being! And when we let go of some things and choose what we enjoy most, it makes everything way more fun! As you can see in this video, I can hardly contain my excitement. I’m doing the best I can, folks, I promise. For those of you unfamiliar with Amazon’s algorithm, the long-term success of a book depends greatly on pre-order sales and verified reviews (among other things). 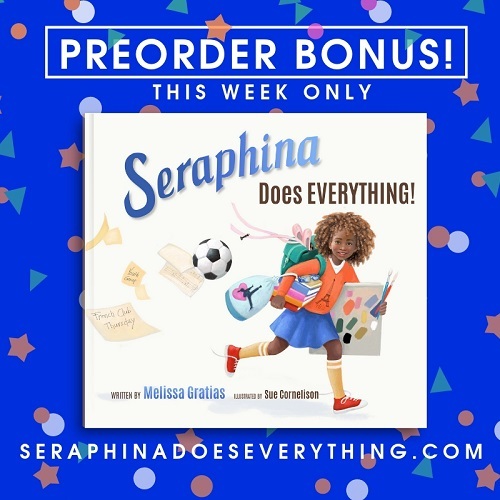 Please, click here to go on Amazon right now and pre-order Seraphina Does Everything! The book is geared toward kids in grades 3 – 6. But there is a message in the story for all of us who are overscheduled and overwhelmed. From April 2 – 8, 2019 only, there is a pre-order bonus! If you are an educator, parent, summer camp leader, after-school-care facilitator, or anyone who would like some resources to help kids learn about life balance, my publisher and I have constructed an 11-page set of downloadable activities to accompany the book. Pre-order the book on Amazon before 4/8/19 at midnight EDT. Copy your order number from Amazon’s check out page. Go to this page and fill out the Pre-Order Form. Paste your order number and enter your email here. Check your email immediately for the download link. The message will come from the National Center for Youth Issues (NCYI). Bonus step: Please go back to Amazon after reading the book and write a review! Verified reviews (i.e., from folks who Amazon knows ordered the book) are so important. That’s it for now, friends (I assume the “Fans and Passersby” have stopped reading by now). Thank you for your support. I hope you fall in love with my Seraphina. Preordered 4! Can’t wait to read with my kids and share with other kids. Really on point topic. Congrats Melissa! Thank you, Kelly! I hope you and the kids enjoy it. If you want the free resource bundle, go to seraphinadoeseverything.com before 4/8/19 at midnight. Congratulations on your new book! I am excited for you on this achievement. I have ordered my copy!!! I’m excited, too, Brenda. Thanks for your support. Congratulations! I’m so happy for you. It looks like a great book. I can’t wait to read it with my little one. I’ve ordered my copy!